Bill Gates famously said, "Content is King!" 20-years later the king still reigns supreme, but community financial institutions struggle to consistently produce engaging content for social media. Scan a community financial institution's social media feed and you'll see posts about branch closures, holidays, and product information. We think content must be limited to facts about our institution. Boring facts. What if we changed the rules? What if we posted not as a banker, but as if we were the local tourism board? One financial institution has embraced this strategy with tremendous success, Citizen's Bank of Edmond. We wanted to understand the steps they took to leverage social media and their community to revitalize their brand, so we sat down with Jill Castilla and Ann Chen. Community is in our blood. That's why we're called "community bank." As community bankers, no one can shower our community with love like we can. Promoting community over our self-interest showcases the care and authenticity that we want our brand to be known for. Plus, on social media, giving is always a more effective strategy than talking about yourself. By making your community the core of your social media content, you connect with a topic that is relevant to your consumers. It is a competitive edge that megabanks can't authentically replicate. Take your existing relationships and find a way to talk about them through social. For example: Do you do financial literacy courses at the local high school? Make a post promoting that a session is coming up. Ask your followers what they wish they had learned about money in high school. Write a post on 5 games to teach your kid about finances. Provide ideas on how parents can use allowance to develop finance skills. Social media isn't new in concept; business development has been part of business activities for years, but social media presents community institutions with new channels to connect with local businesses. Often times, the best community partners on social media are serendipitous. We dubbed this "social serendipity!" You should research social media handles of other active local businesses and engage with them. 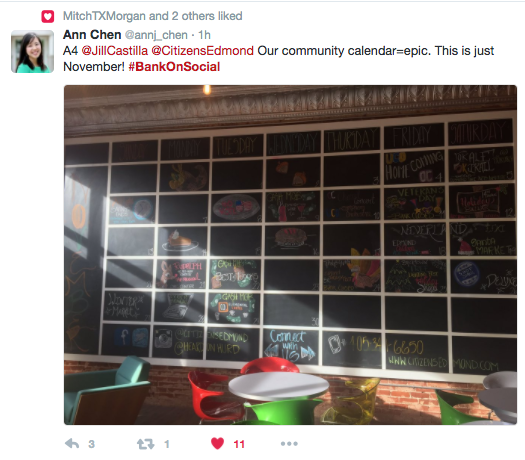 Citizens Bank of Edmond uses events like Cash Mobs and Heard On Hurd to amplify engagement. The basic concept of a Cash Mob is that every employee is given $5. A date and time is picked where every employee will "mob" a local business to spend that $5. Doing this for 40 employees would cost of $200, but the resulting buzz and content from the event would surpass that number in ad value. Plus, consider the feeling that creates for the business owner and the community. Ultimately, you'll want to bring the conversation's focus back to your institution. Some of this is done simply because your brand is the one hosting the conversation. Even subtle choices, like the logo in the background of Jill's Twitter profile picture help build the association. Citizens Bank of Edmond puts community at the center of the branch in a very visual way. There is a massive community calendar in the lobby that highlights upcoming local events. Survey after survey, compliance is listed as the #1 concern for bankers on social media. One of the best parts about making your city the focus of your content is that it is compliance friendly. Since you aren't talking about your institution or products, you shouldn't be using language that has potential implications. That said, you should know exactly who you are building relationships with and consider the context of their profile. An isolated comment might seem harmless, but before you engage you should look to see if there is questionable content on their feed that would create a reputational risk for your institution. Avoid topics that you would avoid at the dinner table like politics and religion. As with most compliance topics, maintaining a record is always a wise choice. Most 3rd-party social media management tools will have this feature. If you don't currently use one, we recommend that you check out IFTTT (If This, Then That). This applet will allow you to automatically save every tweet you send to a google spreadsheet. The reality is that social media is becoming increasingly "pay to play." Industry experts suggest that all social media platforms will continue to restrict organic reach, forcing brands to further incorporate paid efforts into their strategy. Embracing community relationships can help the declining organic reach. A share from a community partner can result in increased exposure to a relevant audience. You will likely need a combination of both paid and organic. Ann Chen recommends boosting posts that are already performing well, but that 80% of your content should be organic. Jill added that they primarily use paid sponsorship to promote events or extraordinary accomplishments. Citizens Bank of Edmond created a community event called Heard on Hurd. This community event features pop-up shops, food trucks, and music -- all organized by Citizens Bank of Edmond. This event brings out 20,000 people every month. Jill reminded us that, like all relationships, building this flow of traffic takes time. By being present on social and attentive to her audience's needs, she gradually builds trust and reputation within the community. Her community regards her as a resource and know that they can turn to her institution whenever they have a question.